For other uses, see Sherpa (disambiguation). This article contains Sambhota Script. Without proper rendering support, you may see question marks, boxes, or other symbols instead of Sambhota script. Most Sherpa people live in the eastern regions of Nepal; however, some live farther west in the Rolwaling Valley and in the Helambu region north of Kathmandu. Sherpas had village gompas (temples) where they practised their religious traditions. Tengboche was the first celibate monastery in Solu-Khumbu. Sherpa people also live in China, Bhutan, and the Indian states of Sikkim and the northern portion of West Bengal, specifically the district of Darjeeling. The Sherpa language belongs to the south branch of the Tibeto-Burman languages, and it is a mixed Eastern Tibet (Khamba) and central Tibetan dialects. However, this language is separate from Lhasa Tibetan and unintelligible to Lhasa speakers. The number of Sherpas migrating to Western countries has significantly increased in recent years, especially to the United States. New York City has the largest Sherpa community in the United States, with a population of approximately 3,000. The 2001 Nepal census recorded 154,622 Sherpas within its borders. Some members of the Sherpa population are known for their skills in mountaineering as a livelihood. The Sherpa were nomadic people who first settled in the Solukhumbu District (Khumbu), Nepal. According to Sherpa oral history, four groups migrated from Kham in eastern Tibet to Solukhumbu at different times, giving rise to the four fundamental Sherpa clans: Minyagpa, Thimmi, Sertawa and Chawa. These four groups gradually split into the more than 20 different clans that exist today. Mahayana Buddhism religious conflict may have contributed to the migration out of Tibet in the 13th and 14th centuries and arrived in Khumbu regions of Nepal. Sherpa migrants travelled through Ü and Tsang, before crossing the Himalaya. By the 1400s, Khumbu Sherpa people attained autonomy within the newly formed Nepali state. 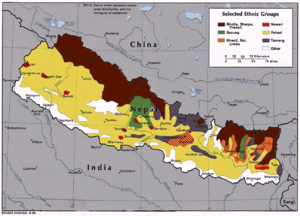 In the 1960s, as tension with China increased, Nepali government influence on the Sherpa people grew. In 1976, Khumbu became a national park, and tourism became a major economic force. Gautam (1994) concluded that the Sherpa migrated from Tibet to Nepal approximately 600 years ago, initially through Rongshar to the west and then later through the Nangpa La pass. It is presumed that the group of people from the Kham region, east of Tibet, was called "Shyar Khamba" (People who came from eastern Kham), and the place where they settled was called "Shyar Khumbu". As the time passed, the "Shyar Khamba," inhabitants of Shyar Khumbu, were called Sherpa. A recent Nepal Ethnographic Museum (2001) study postulated that present-day Nepal became an integral part of the kingdom of Nepal. Since ancient times, Sherpas, like other indigenous Kirat Nepalese tribes, would move from one place to another place within the Himalayan region surviving as Alpine pastoralists and traders. 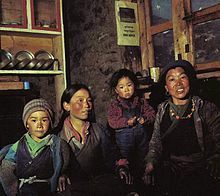 Genetic studies shows that much of the Sherpa population has allele frequencies which are often found in other Tibeto-Burman regions, in tested genes, the strongest affinity was for Tibetan population sample studies done in Xizang Tibetan Autonomous Region. Genetically, the Sherpa cluster closest with the sample Tibetan and Han populations. Additionally, the Sherpa had exhibited affinity for several Nepalese populations, with the strongest for the Rai people, followed by the Magars and the Tamang. A 2016 study of Sherpas in China suggested that a small portion of Sherpas and Tibetans allele frequencies originated from separate ancient populations, which was estimated to have remained somewhat distributed for 11,000 to 7,000 years. A 2014 study observed that considerable genetic components from the Indian Subcontinent were found in Sherpa people living in China. The western Y chromosomal haplogroups R1a1a-M17, J-M304, and F*-M89 comprise almost 17% of the paternal gene pool in tested individuals. In the maternal side, M5c2, M21d, and U from the west also count up to 8% of people in given Sherpa populations. However, a later study from 2015 did not support the results from the 2014 study; the 2015 study concluded that genetic sharing from the Indian subcontinent was highly limited; a 2017 study found the same. In a 2015 study of 582 Sherpa individuals (277 males) from China and Nepal, Haplogroup D-M174 was found most frequently, followed by Haplogroup O-M175, Haplogroup F-M89 and Haplogroup K-M9. The Y-chromosome haplogroup distribution for Sherpas follow a pattern similar to that for Tibetans. Sherpa mtDNA distribution shows greater diversity, as Haplogroup A was found most frequently, followed by Haplogroup M9a, Haplogroup C4a, Haplogroup M70, and Haplogroup D. These haplogroups are also found in some Tibetan populations. However, two common mtDNA sub-haplogroups unique to Sherpas populations were identified: Haplogroup A15c and Haplogroup C4a3b1. Many Sherpa are highly regarded as elite mountaineers and experts in their local area. They were immeasurably valuable to early explorers of the Himalayan region, serving as guides at the extreme altitudes of the peaks and passes in the region, particularly for expeditions to climb Mount Everest. Today, the term is often used by foreigners to refer to almost any guide or climbing supporter hired for mountaineering expeditions in the Himalayas, regardless of their ethnicity. Because of this usage, the term has become a slang byword for a guide or mentor in other situations. Sherpas are renowned in the international climbing and mountaineering community for their hardiness, expertise, and experience at very high altitudes. It has been speculated that part of the Sherpas' climbing ability is the result of a genetic adaptation to living in high altitudes. Some of these adaptations include unique hemoglobin-binding capacity and doubled nitric oxide production. On 18 April 2014, a serac collapsed above the Khumbu Icefall on Mount Everest, causing an avalanche of massive chunks of ice and snow which killed 16 Nepalese guides, mostly Sherpas. The 2014 avalanche is the second deadliest disaster in Everest's history, only superseded by avalanches in the Khumbu Icefall area just a year later, on 25 April 2015, caused by a magnitude 7.8 earthquake in Nepal. In response to that tragedy and others involving deaths and injuries sustained by Sherpas hired by climbers, and the lack of government support for Sherpas injured or killed while providing their services, some Sherpa climbing guides walked off the job, and some climbing companies are no longer providing guides and porters for Everest expeditions. According to oral Buddhist traditions, the initial Tibetan migration was a search for a beyul (Buddhist pure-lands). Sherpa practise the Nyingmapa, the "Ancient" school of Buddhism. Allegedly the oldest Buddhist sect in Tibet, founded by Padmasambhava (commonly known as Guru Rinpoche) during the 8th century, it emphasizes mysticism and the incorporation of local deities shared by the pre-Buddhist Bon religion, which has shamanic elements. Sherpa particularly believe in hidden treasures and valleys. Traditionally, Nyingmapa practice was passed down orally through a loose network of lay practitioners. Monasteries with celibate monks and nuns, along with the belief in reincarnated spiritual leaders, are later adaptations. In addition to Buddha and the great Buddhist divinities, the Sherpa also believe in numerous deities and demons who inhabit every mountain, cave, and forest. These have to be respected or appeased through ancient practices woven into the fabric of Buddhist ritual life. Many of the great Himalayan mountains are considered sacred. The Sherpa call Mount Everest Chomolungma and respect it as the "Mother of the World." Mount Makalu is respected as the deity Shankar (Shiva). Each clan reveres certain mountain peaks and their protective deities. Today, the day-to-day Sherpa religious affairs are presided over by lamas (Buddhist spiritual leaders) and other religious practitioners living in the villages. The village lama who presides over ceremonies and rituals can be a celibate monk or a married householder. In addition, shamans (lhawa) and soothsayers (mindung) deal with the supernatural and the spirit world. Lamas identify witches (pem), act as the mouthpiece of deities and spirits, and diagnose spiritual illnesses. An important aspect of Sherpa religion is the temple or gompa. A gompa is the prayer hall for either villages or monasteries. There numerous gompas and about two dozen monasteries scattered throughout the Solukhumbu region. The monasteries are communities of lamas or monks (sometimes of nuns) who take a vow of celibacy and lead a life of isolation searching for truth and religious enlightenment. They are respected by and supported by the community at large. Their contact with the outside world is focused on monastery practices and annual festivals to which the public is invited, as well as the reading of sacred texts at funerals. Traditional Sherpa architecture, but with a steel roof. "A Sherpa community will most commonly get together for a party, which is held by the host with the purpose of gaining favor with the community and neighbors". Guests are invited hours before the party will start by the host’s children to reduce the chance of rejection. The men are seated by order of status, with those of lesser status sitting closer to the door and men of higher status sitting by the fireplace, while the women sit in the center with no ordering. It is polite to sit in a space lower than one’s proper place so one may be invited by the host to their proper place. The first several hours of the party will have only beer served, followed by the serving of food, and then several more hours of singing and dancing before people start to drift out. The act of manipulating one’s neighbors into cooperation by hosting a party is known as Yangdzi, and works by expecting the hospitality done by the host with the serving of food and alcohol to be repaid. One of the best-known Sherpas is Tenzing Norgay. In 1953, he and Sir Edmund Hillary became the first people known to have reached the summit of Mount Everest. Norgay's son Jamling Tenzing Norgay also climbed Everest in honor of his father with the mountaineers Ed Viesturs and Araceli Segarra during the disastrous year of 1996. In 2001, Temba Tsheri became the youngest Everest climber in the world (holder of the Guinness World Record), then aged 16. In 2003, Sherpas Pemba Dorje and Lhakpa Golu competed to see who could climb Everest from base camp the fastest. On 23 May 2003, Dorje reached the summit in 12 hours and 46 minutes. Three days later, Golu beat his record by two hours, reaching the summit in 10 hours 46 minutes. On 21 May 2004, Dorje again improved the time by more than two hours with a total time of 8 hours and 10 minutes. On 11 May 2011, Apa Sherpa successfully reached the summit of Everest for the twenty-first time, breaking his own record for the most successful ascents. He first climbed Mount Everest in 1989 at the age of 29. One of the most famous Nepalese female mountaineers was Pasang Lhamu Sherpa, the first Nepali female climber to reach the summit of Everest, but who died during the descent. Her namesake, Pasang Lamu Sherpa Akita, has also climbed Everest, and was one of three Nepali women who were the first to reach the summit of K2. Another well-known female Sherpa was the two-time Everest summiter Pemba Doma Sherpa, who died after falling from Lhotse on 22 May 2007. On May 20, 2011, Mingma Sherpa became the first Nepali and the first South Asian to scale all 14 of the world's highest mountains. In the process, Mingma set new world record – he became the first mountaineer to climb all 14 peaks on first attempt. Lakpa Tsheri Sherpa is one half of a Nepali duo that was voted "People's Choice Adventurers of the Year 2012". In April 2011, Lakpa Tsheri and Sano Babu Sunuwar made the 'Ultimate Descent': a three-month journey in which they climbed Everest, then paraglided down the mountain and proceeded to kayak through Nepal and India until they reached the Indian Ocean. On 19 May 2012, 16-year-old Nima Chhamzi Sherpa became the youngest woman to climb Everest; the previous record holder was Nimdoma Sherpa, who summited in 2008, also at 16 years old. Chhurim Sherpa (Nepal) summitted Everest twice in May 2012: 12 May and 19 May. Guinness World Records recognized her for being the first female Sherpa to summit Everest twice in one climbing season. In 2013, 30-year-old Chhang Dawa Sherpa became the youngest mountaineer to summit the 14 highest peaks, the 8000'ers. Pratima Sherpa 19(2017), has lived her entire life in a maintenance shed on the fourth hole of Royal Nepal Golf Club in Kathmandu, and is the top-ranked female golfer in Nepal. On July 26, 2014, Pasang Lamu Sherpa Akita, Dawa Yangzum Sherpa, and Maya Sherpa crested the 28,251-foot (8,611-meter) summit of K2, the second highest mountain in the world. In doing so, the three Nepali women have become the first all-female team to climb what many mountaineers consider a much tougher challenge than Everest. The feat was announced in climbing circles as a breakthrough achievement for women in high-altitude mountaineering. Only 18 of the 376 people who have summited K2 have been women. Another notable Sherpa is cross-country skier and ultramarathoner Dachhiri Sherpa, who represented Nepal at the 2006, 2010, and 2014 Winter Olympics. Similarly Cultural and tourism Minister of Nepal Kripasur Sherpa, Major of British Gurkha Army Prem Dorji Sherpa, ambassador of Australia Lucky Sherpa are notable personnels from Sherpa communities. ^ "Journée d'étude : Déserts. Y a-t-il des corrélations entre l'écosystème et le changement linguistique ?". Lacito.vjf.cnrs.fr. Archived from the original on 18 March 2012. Retrieved 8 March 2012. ^ a b c d e Bhandari, Sushil; et al. (2015). "Genetic evidence of a recent Tibetan ancestry to Sherpas in the Himalayan region". Scientific Reports. 5: 16249. doi:10.1038/srep16249. PMC 4633682. PMID 26538459. ^ a b c d Sherpa, Lhakpa Norbu (2008). Through A Sherpa Window: Illustrated Guide to Traditional Sherpa Culture. Jyatha, Thamel: Vajra Publications. ISBN 9789937506205. ^ "Tapting Samaj Sewa". Tapting.org. Retrieved 8 March 2012. ^ "Nepal Ethnographic Museum". Asia-planet.net. Retrieved 8 March 2012. ^ a b c Cole, Amy M.; Cox, Sean; Jeong, Choongwon; Petousi, Nayia; Aryal, Dhana R.; Droma, Yunden; Hanaoka, Masayuki; Ota, Masao; Kobayashi, Nobumitsu; Gasparini, Paolo; Montgomery, Hugh; Robbins, Peter; Di Rienzo, Anna; Cavalleri, Gianpiero L. (2017). "Genetic structure in the Sherpa and neighboring Nepalese populations". BMC Genomics. 18 (1): 102. doi:10.1186/s12864-016-3469-5. ISSN 1471-2164. PMC 5248489. PMID 28103797. This article contains quotations from this source, which is available under the Creative Commons Attribution 4.0 International (CC BY 4.0) license. ^ Lu, Dongsheng; et al. (September 1, 2016). "Ancestral Origins and Genetic History of Tibetan Highlanders". The American Journal of Human Genetics. 99. ^ Kang, Longli; Wang, Chuan-Chao; Chen, Feng; Yao, Dali; Jin, Li; Li, Hui (2 January 2016). "Northward genetic penetration across the Himalayas viewed from Sherpa people". Mitochondrial DNA Part A. 27 (1): 342–349. doi:10.3109/19401736.2014.895986. ISSN 2470-1394. PMID 24617465. ^ Educational Media and Technology Yearbook - Volume 36, Michael Orey, Stephanie A. Jones, Robert Maribe Branch, page 94 (2011), ISBN 1461413044: "A Sherpa is traditionally a knowledgeable native who guides mountain climbers on their most difficult and risky ascents." Buried in the Sky: The Extraordinary Story of the Sherpa Climbers, by Peter Zuckerman, Amanda Padoan, page 65 (2012): "Lowlanders clutching the Lonely Planet guide are convinced they want to hire “a sherpa,” even if they don't know what a Sherpa is..."
^ "G20 meet: What role does the Sherpa play in the negotiations?". The Indian Express. 2016-09-06. Retrieved 2018-10-07. ^ Kamler, K. (2004). Surviving the extremes: What happens to the body and mind at the limits of human endurance, p. 212. New York: Penguin. ^ Krakauer, Jon (21 April 2014). "Death and Anger on Everest". The New Yorker. Retrieved 24 April 2014. Of the twenty-five men hit by the falling ice, sixteen were killed, all of them Nepalis working for guided climbing teams. ^ McCarthy, Julie (April 24, 2014). "Sherpas Walk Off The Job After Deadly Avalanche". NPR. ^ The Associated Press (April 21, 2014). "Sherpas Consider Boycott After Everest Disaster". NPR. ^ "When you call someone a Sherpa, what does that mean?". Public Radio International. Retrieved 2018-10-07. ^ Sherpa, Ngawang Tenzin Zangbu (2011). Stories and Customs of the Sherpas (5th edition). Kathmandu, Nepal: Mera Publications. p. 6. ISBN 99933-553-0-5. ^ Ortner, Sherry B. (1978). Sherpas Through Their Rituals. Melbourne, Australia: Cambridge University Press. pp. 61–75. ISBN 978-0-521-29216-0. ^ "1953: First Footsteps - Sir Edmund Hillary and Tenzing Norgay". National Geographic. Retrieved 2014-08-01. ^ Christchurch City Libraries, Famous New Zealanders. Retrieved 23 January 2007. ^ "New Everest Speed Record Upheld". EverestNews.com. Retrieved 4 February 2007. ^ "Apa Sherpa summits Everest for the 21st time'". Salt Lake Tribune. 11 May 2011. Retrieved 11 May 2011. ^ "Since The Age of 12". BBC News. BBC. 11 May 2011. Retrieved 8 March 2012. ^ Osius, Alison (17 February 2016), "Snowball Fight on K2: Interview with Pasang Lamu Sherpa Akita", Rock & Ice, archived from the original on 18 December 2016 . ^ "2012 Winners: Sano Babu Sunuwar and Lakpa Tsheri Sherpa". National Geographic. Retrieved 3 March 2012. ^ "Four Confirmed Dead in Two Day on Everest". 2012-05-21. Retrieved 23 May 2012. Wikimedia Commons has media related to Sherpa.